Our shirts are made of super soft fine jersey 30/1 combed ring spun 100% cotton 4.3 oz/sq yd, 7.15 oz/ly, 146 g/m2. They are set on rib collar with double needle sleeve hem & bottom hem, tape shoulder to shoulder. Preshrunk to minimize shrinkage. Cotton is obtained from the seedpod of the cotton plant that is made into strands of fiber. A soft vegetable fiber. These strands of cotton fiber are then twisted together to make yarn. This yarn is then woven together to produce different products of fabrics. 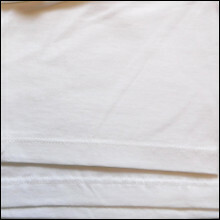 This is the type of cotton fabric used in regular apparel products that shows 100% cotton, or 60% cotton and 40% polyester. A more heavier and rougher type of apparel product. A slightly different process is used to create Ring-spun cotton. The same cotton fiber strands is used as for the regular cotton. The Ring-spun process twists this regular yarn continuously and thins the strands, making it a very fine rope of cotton fibers. 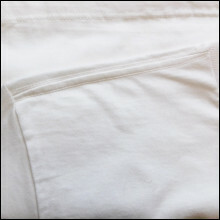 The twisting makes the short hairs of cotton stand out, resulting in a stronger yarn with a significantly softer touch. The number of times the fiber gets twisted determines how soft it will be. In many cases, we will see something described as 30 Singles Ring-Spun. This a term used to indicate the diameter of a yarn. The smaller the number, the thicker the yarn. The higher the number the thinner and softer the yarn, because it has been twisted more times. A garment made of Ring-Spun cotton will be lighter in weight compare to a garment made of regular cotton. 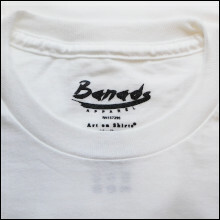 A 6.1-oz 100% (regular) cotton t-shirt may be heavier than a 4.3-oz 100% Ring-spun cotton t-shirt, but the lighter weight Ring-spun t-shirt may be a lot more durable because of the stronger yard. Here, you find one of our chief comfort engineers hard at work. 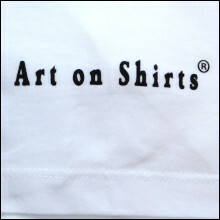 A tiresome job, but we spare no expense when it comes to the softness of our shirts. The comfort and softness of our shirts have been German Shepherd tested and approved. Only soft knows soft, so we put our softest employee to test the comfort of each of our shirts. The proverbial chicken and egg scenario: Did we make these shirts strong or did these shirts make us strong? Just like the question, our shirts will last for ages. Don’t settle for less than the strongest gym partner. Our shirts will never quit on you. Pair the strongest muscle fibers with the strongest shirt fabrics.